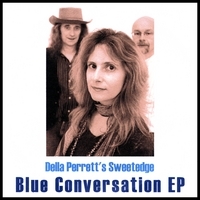 Unconventional, haunting, sophisticated and uplifting are just a few of the words that have been used to describe Della Perrett’s powerful voice. She fuses folk, blues, jazz, country and rock influences into something that is totally her own. Her songs are both political and personal,sometimes sweet but at other times sharp and thought provoking. Her substantial experience playing tenor sax shapes her vocal style as it twists and soars from dark to light. This EP features contributions from many of the 'luminaries' of the Portsmouth Music Scene including Simon Cunningham (from Los Hombres Inglese) on drums, Muzz Murray (from Rhythm Collision) on bass, Nick Evans (from Reet, Petite and Gone) on pedal steel and bass, Paul Ramsay on Violin, Matthew Carless on Trombone, Mike Birch on Flugelhorn, Mark Stamos on guitar and Noel J on keyboards.